This week in July is always a big one, this year the disability community came together to celebrate the 27th anniversary of the signing of the Americans with Disabilities Act and the 52nd anniversary of the Medicaid and Medicare programs. But a large looming shadow hung over these celebrations, the current healthcare proposals in the House and Senate. During the past six months, most of my professional life has been consumed by the fight to save Medicaid. Today I was honored to speak as a sibling and professional at a Capitol Hill event celebrating the 52nd anniversary of Medicaid and Medicare, to highlight why we must continue our fight to SAVE MEDICAID. My name is Nicole Jorwic, I am the Director of Rights Policy at The Arc of the United States. The Arc promotes and protects the human rights of people with intellectual and developmental disabilities and actively supports their full inclusion and participation in the community throughout their lifetimes. I am here today though, as a sister. My brother Chris will be 28 years old tomorrow and has autism, he is the reason that I do the work that I do, and as a Medicaid recipient, he is one of the millions of individuals at risk if the proposals in the House and Senate healthcare reform bills become law. We know the numbers – between 22-32 million will lose coverage, millions will lose Medicaid and anywhere from $202 billion (in the “skinny repeal”) to $836 billion (in the House bill) in cuts to federal Medicaid spending. But those numbers represent people, they represent Chris, they represent the 43 heroes from National ADAPT that were arrested last month after staging a die in at Senator McConnell’s office. That’s right, a die in because Medicaid is literally life and death for people with disabilities. I was lucky enough to be there in solidarity with National ADAPT last month and as I watched people who I respect and admire being pulled from the wheelchairs they use, literally putting their bodies on the line for people like Chris, I wept. The current proposals quite simply devalue groups of human beings, gutting the Medicaid program, a program that over 10 million people with disabilities and families like mine rely on, and they show that the drafters of this legislation don’t see the value in investing in the lives of the poor, the aging population, pregnant women, people with disabilities, including my Chrissy. Medicaid is so much more than a health program, it funds long term supports and services that allow people with disabilities to live their full life in the community. Medicaid funded the communication device that gave my nonverbal brother a voice, so that he can advocate for himself. Medicaid funds the day support services that allow my mom, a college professor, and my dad, a small business owner, to remain in their jobs. Families like mine started The Arc over 65 years ago to get people OUT of Institutions and included in their communities, and now those antiquated and segregating services may be the only thing left. This is because institutions and nursing homes remain mandatory services, while home and community based services are optional, and will therefore be the first cut when the devastating federal cuts to Medicaid come to the states. We cannot let that happen, we must SAVE MEDICAID. People’s lives literally depend on it. Chris’ does. The proposals to decimate the Medicaid program to provide tax cuts to corporations and the wealthy is morally reprehensible. As an advocate and Chris’ sister I will do everything I can to stop the current healthcare bills and protect the integrity of the Medicaid program that we are here celebrating today. As more community-based providers of supports and services to people with intellectual and developmental disabilities (I/DD) strive to reinvent themselves to offer inclusive opportunities and keep up with Employment First, WIOA, CMS Final Settings Rule, DOJ’s application of Olmstead to employment, and expectations of the ADA generation, organizational leadership may find themselves wondering how to accomplish such a feat. Where’s the finish line? Where’s the starting block? The Arc believes that people with intellectual and developmental disabilities belong in the community and have fundamental moral, civil and constitutional rights to be fully included and actively participate in all aspects of society. The Arc is pleased to be working toward finding and sharing information to support its chapters on their journeys toward community employment with leading employment researchers as a sub-grantee of the Rehabilitation Research and Training Center (RRTC) on Advancing Employment for Individuals with Intellectual and Developmental Disabilities, a project of ThinkWork! at the Institute for Community Inclusion at University of Massachusetts – Boston on a five-year National Institute on Disability, Independent Living, and Rehabilitation Research (NIDILRR) grant aimed at employment of people with I/DD. As part of this collaboration, staff from The Arc co-conducted interviews with leadership from eight organizations which have transformed their employment service delivery from sheltered work to competitive community employment. A brief sharing advice from those interviews was recently released telling us to Commit. Plan. Engage. Implement. The next step in this collaboration is an intervention aimed at service providers to aide them in transforming their sheltered workshop models to community-based employment programs. This intervention will provide best practice information and other resources to service providers via a comprehensive toolkit. We are currently looking for chapters to participate in our intervention pilot this summer. The pilot will be six weeks in duration and will consist of reviewing the toolkit, preliminary planning and implementation of pertinent best practices, and providing feedback to The Arc national staff to ensure that the final version of the toolkit is useful and will best support organizations with implementing the conversion process. If you are interested in learning more or participating in the pilot process, please contact Jonathan Lucus, Director of The Arc@Work at: lucus@thearc.org or at 202.534.3706. “A new draft, new talking points, same devastating impact on people with intellectual and developmental disabilities. It is disheartening to know that Senators were in their districts for the last week, yet the pleas of their constituents with disabilities have been ignored with the latest draft of this legislation. This response to the extensive and impressive outreach from the disability community is an insult to people with disabilities and their families. “The Better Care Reconciliation Act is an assault on people with disabilities and we implore Senators to do the right thing and oppose this bill. A vote in favor of this bill is a vote against the progress of the disability rights movement and constituents who rely on Medicaid for their independence,” said Peter Berns, CEO of The Arc. On June 22, 2017, the Senate Budget Committee released a discussion draft of health care reform legislation, the “Better Care Reconciliation Act of 2017” (“Senate bill”). The Congressional Budget Office (CBO) released an analysis of the cost of the bill and the impact on health care coverage. CBO found that at least 22 million fewer individuals would have health care coverage by 2026. CBO also found that the Senate bill cuts Medicaid by $772 billion over 10 years, but the most severe cuts do not begin to take effect until 2025. Starting in 2025, the cuts are billions more than the cuts in the House bill and would increase significantly over time. CBO found that, compared to current law, Medicaid would decrease by 35% in 2036. The current discussion draft from the Senate did include a woefully inadequate home and community based four-year demonstration program for rural states. A total of $8 billion is available over four years. In contrast, the discussion draft retains the $19 billion dollar cut made to the Community First Choice Option which is a program available to any state that chooses the option with no end date. Join us at the Back to School Carnival! This event is free and open to the public! 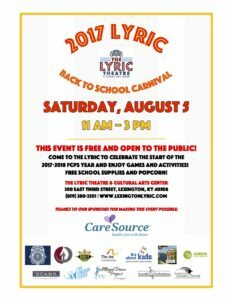 The Lyric Theatre hosts the 2017 Back To School Carnival on Saturday, August 5 11AM – 3PM. Come to The Lyric to celebrate the start of the 2017-2018 Fayette County Public School Year and enjoy games and activities. Free school supplies and popcorn!